Congress and SP tussle over 10 assembly seats in Amethi and Rae Bareli. After playing a key role in clinching the Samajwadi Party-Congress pre-poll pact in Uttar Pradesh, Priyanka Gandhi Vadra has another difficult task at hand. 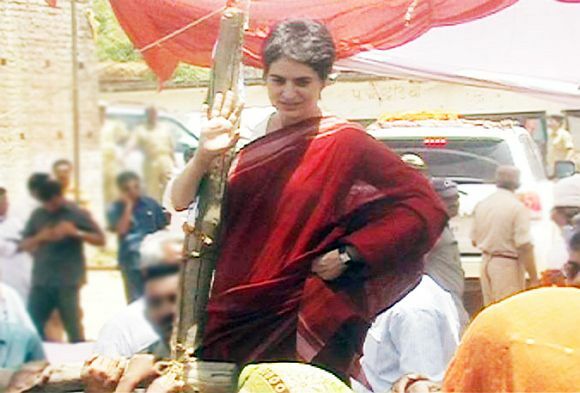 According to sources, the tussle over the 10 assembly seats falling under Amethi and Rae Bareli parliamentary constituencies, considered to be Nehru-Gandhi family bastions, has reached the doorstep of Priyanka who may speak to SP chief Akhilesh Yadav over the issue. Congress strategists are miffed that the SP has left only four of the 10 seats for the Congress, which wants to contest all 10 as it does not want to cede space to the SP in the Gandhi family strongholds. Adopting a tough posture, the Congress has started campaigning for its candidates on all 10 assembly seats even as there is no clarity on seat-sharing in the VVIP area. "Our candidates have started campaigning in all 10 assembly seats. We will lay claim on all 10 seats," said Congress managers. According to sources, in the Rae Bareli area, the SP has left Unchahar and Sareni assembly seats for the Congress and has declared its candidates in the remaining three: Harchandpur, Bachchrawan, and Sadar. Similarly, in the Amethi area, the SP has left Jagdishpur and Tiloi assembly seats for the Congress while it has declared nominees in Amethi, Gauriganj, and Salon. "The SP has even allotted poll symbol the bicycle to its candidates for filing nomination," said a Congress strategist. Noting that there was still time for negotiations as these seats will go to the polls in phase IV and V on February 23 and 27 respectively, the leader said, "The top bosses are at it… let's see what happens." Sources said the Congress workers, who have been working hard for many months, would be upset if the party is seen playing second fiddle to the SP in the VVIP areas. The SP, which had won seven of the 10 seats in the 2012 assembly polls. says it has the first claim on the tickets. The SP has declared Gayatri Prasad Prajapati from Amethi, Rakesh Pratap Singh from Gauriganj, Asha Kishore from Salon, Devendra Pratap Singh from Sareni and Manoj Kumar Pandey from Unchahar, all sitting lawmakers. SP sources said the Congress had lost all five assembly seats under the Rae Bareli parliamentary constituency and could win only two -- Jagdishpur and Tiloi -- under the Amethi parliamentary constituency, in the 2012 assembly polls. Further, its nominee from Tiloi, Mohammad Muslim defected to the Bahujan Samaj Party last year when he voted again party nominee Kapil Sibal for the Rajya Sabha polls. He was expelled from the Congress soon after. The other, Radhey Shyam from Jagdishpur, may be fielded again, the sources said.